LAUGHARNE, Wales -- Sir John's Hill, at first, may not seem a striking place. It peaks only 280 feet above sea level. As it is set against the sea, on a stretch of southern coastline in West Wales that rises toward farm-topped heights then falls to the waiting mouths of river and estuary only to rise again, mile after mile, such a hill is all the more common. More, Sir John's Hill has been trod for centuries, as noted by its own skullcap farm, pastures thick and green even in January, and in the woodlands below, where a trail leads from the town up and around to a bench. Men and women in gum boots walk the trail with their dogs. Lone herons arc low past the hill's steep east flank and stop, occasionally, in the grassy banks below. Fog embraces it all until wind hurtles past, rushing the tide up the rivers Towy and Taf. Yet, amid this ebb and flow, Sir John's Hill stands without a stagger. Such a presence led one local woman, who has viewed the hill for nearly eight decades, to say recently, "The impression of it, always, is as if it were changeless." "Flash, and the plumes crack, / And a black cap of jack- / Daws Sir John's just hill dons, and again the gulled birds / hare / To the hawk on fire, the halter height, over Towy's fins, / In a whack of wind." "In a hoisted cloud, at drop of dusk, he pulls to his claws / And gallows, up the rays of his eyes the small birds of / the bay / And the shrill child's play / Wars / Of the sparrows such who swansing, dusk, in wrangling / hedges." " . . . and I who hear the tune of the slow, / Wear-willow river, grave, / Before the lunge of the night, the notes on this time-shaken / Stone for the sake of the souls of the slain birds sailing." From the north end of Laugharne, Sir John's Hill is obscured by the snug stone buildings of the tussled town and the ruins of the castle that survive 10 centuries after Normans carved a piece of England from the Welsh coast, only to be battered back to sea. A two-lane country road passes the tree-shaded church of St. Martin's, where a white cross in the cemetery marks Thomas's grave, and continues between tight sidewalks lined with tidy shops and windows shaded by living-room lace. In Corran bookshop, shelves of volumes cascade from one room to the next. Brown's Hotel, Thomas's favored pub, pours its pints of bitter and retreat for regulars in a town that is home to a potter, a silversmith, and a furniture maker. Every three years, residents rally by "beating the bounds," walking 20 miles of town boundary in a tradition carried on since before the castle went cold. Just beyond the jagged, jutting castle remains, at the end of "Upstreet," as it's known, and down a steep pitch, the estuary opens wide with deep grass, dark mud, and whipped water. A paved foot trail leads left, below the castle toward the cliff-top writing shed and the old boathouse that was Thomas's last home. Another leads right, to the trail that climbs, slowly, Sir John's Hill. In one nearby house, not far up Gosport Street, lives a couple who, like many of those settled among the meandering lanes and hillside farmhouses, witness the daily merger of land and water, reality and poetry. The couple are in their 70s, he, with a trimmed white mustache and beckoning snap-laugh; she, a lover of Latin with a generous way of saying Laugharne (laaaarrnnn, long and easy) that could only come from growing up here, near the old town docks, a world of cockles and sea salt. "Stony Way rats, / Gosport cats, / Upstreet lords and ladies." Wil Rees, who, after a childhood in a coal town and career as a school headmaster in sheep country to the north, returned with Rosemary to her hometown, sits alongside a bookshelf weighted with Welsh words turned to poetry. But he savors, too, Thomas's English-language rhythms. Asked to read just one, Wil laughs, blushes, then retreats to a backroom and returns with a paperback volume of Thomas's collected poems. The binding is broken. "In the beginning was the three-pointed star, / One smile of light across the empty face . . ."
Wil's voice lifts verbs, halts on subtle breaks, and strides across another line to draw out the alliteration of each word's first consonant. Later, asked to read aloud "Over Sir John's hill," he declines. "I'll have to read it again and study it, and I think I might read it differently than I did even 10 years ago. And I will have to go back to Sir John's Hill myself," he says. "Oh yes, it will not come otherwise." At times, Sir John's Hill fades at the edge of the estuary and of a 20-year career reading and writing during which Thomas rose as one of his century's lyrical innovators, hailed across an ocean not so easily traversed. It has been said that along the way, Thomas became, essentially, the first rock star. He wrote poems and short stories, essays and film scripts. He read at universities and lecture halls and, more than a hundred times, on the airwaves of the BBC. Among his last projects, he had met Igor Stravinsky in Boston to consider collaboration on an opera. The poet, husband, and a father of three, drank too much, met mistresses far from home, and died at an awful, august, early age. His 39 years began in 1914, in Swansea, a port city that he rightly described as "an ugly, lovely town." It is that place, an hour east of Laugharne, that claims the poet's earliest inspirations and longest legacy, as measured in the high stone facade of the seafront Dylan Thomas Centre, rich with words and images cataloging and analyzing a life that began in a sturdy home on a steep street near a park with manicured lawns. Yet Thomas and his writing were a work in progress, from those early days when his poems were, as he said, "explosive bloodbursts of a boily boy in love with the shape and sounds of words, death, unknown love and the shadows on his pillow," and it is quiet, complex Laugharne to which, and in which, he evolved. In Laugharne, Thomas toiled on a series of poems, including "Over Sir John's hill," that were to form pieces of an unfinished sermon to be called "In Country Heaven." The town and its tenants offered characters and cadence for "Under Milk Wood," Thomas's "play for voices." Living in the "starless and bible-black" night and upon the "sunlit cockled cobbles" of day, Captain Cat and the Rev. Eli Jenkins, Organ Morgan, and Mrs. Dai Bread One and Mrs. Dai Bread Two see the day begin and end again. At the boathouse, now kept as a museum, a video traces Thomas's life and work. A small shop offers biographies and critiques, details and explanations about what Thomas did. Late one night, a walk up a side lane passes two young girls who lean from a second-floor window and giggle "Good evening" and continues beyond a bakery and a second, small cemetery set above a cliff. Thomas made this same walk many times, after work and drink at end of day, going home to the boathouse. On this night, bible-black if this is what the poet meant, the writing shed sits harnessed by trees above the estuary. Flashlight beams pass panes of glass into a narrow room, preserved with upright chair, tossed tie, and tumbled books. Sketches and photos cling to walls. Crumbles of dead paper crowd the floor beneath the desk set beside a window that looks out across the spilled silver of the estuary, where Sir John's Hill, unseen, waits still. By morning, cold and gray, the hill rests beneath a breathless sky. The leaf-layered path rises to a clearing, where a sign details the lives of golden plovers, ringer plovers, curlews, and herons, peregrine falcons and a duck called Worms Head, all of whom make their homes in waterside hideouts below. 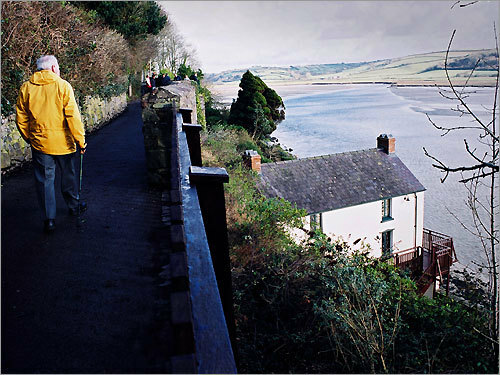 Farther up the trail, around a bend that opens above the salt marsh, the flat of the Laugharne sands, and the sea, the trail passes the sitting bench, where, when a book is opened, the words of "Over Sir John's hill" rise to meet chalky birdcalls and an earthy embrace. First, Thomas introduces the hawk, next the sparrows. Spectators of this simple ritual arrive, too, first in the "fishing holy stalking heron," then in the poet, "I." As stanzas move from sky to river and back again, routine becomes event, in the "shrill child's play wars" of the sparrows and in the loft hawk, who calls, " 'dilly dilly,' Come and be killed." During this first visit and first reading, the poem seems a tale of hunter and prey, of wading and watching. "I open the leaves of the water at a passage / Of psalms and shadows among the pincered sandcrabs / prancing / And read, in a shell, / Death clear as a buoy's bell." Death lurks among the lines, in the hawk's gallows and in the "elegiac fisherbird" below, within the "crystal harbor vale" and the "knelled Guilt of the led-astray birds." "I young Aesop fabling to the near night by the dingle/of eels . . ."
Another day now, rainy again, and the parking lot between the trails leading left and right sits splashed by gum boots and dogs on their journeys. This time, it is Thomas who will read, his voice preserved on a compact disc slipped into the car stereo. In this recording of the poem, his words have a bit of bellow and boom, a tone found, occasionally, in his opening remarks at speaking engagements and in his interpretations of others' poetry. In a second version, he tells the audience simply, "Sir John's Hill is a real hill, overlooking an estuary in West Wales." Then, after a steady, preparatory breath, his voice changes timbre, slightly. He speaks from the humble heights of a person of more years than his, setting the poem in a tone at once intimate and grand, between every day and eternity. His voice moves evenly, deliberately, taking care, as he himself preached, to "love the words." The hawk pulls gingerly the "Green chickens of the bay and bushes" up to his gallows, above the "wharves of water where the walls dance and white / cranes stilt." Thomas has left the comfort of his shedded perch, set upon a world of pints and pudding, books and bustle, to bring us to "judging Sir John's elmed hill," real and imagined, to face the last of life. After nearly four minutes, it is the poet, or "I," who ponders still the snapped feathers, the fed hawk, and the heron who, "ankling the scaly lowlands of the waves, / Makes all the music. . . ."
Thomas's final poetic monument -- the heron's notes graved in stone -- stands firm. Yet the poet's choice to see such end in the blaze of twilight, haunts, demanding more understanding and witness of its own. "Over Sir John's hill, /the hawk on fire hangs still . . ."
Tom Haines can be reached by e-mail at thaines@globe.com.